Mention offer "WH1002017" at the time of booking to take $100 off all Wildhearted Packages. See below for a la carte pricing. Professional Celebrant Services - All Legal Paperwork & a Bespoke, heartfelt wedding ceremony for two people. Up to 4 hrs Wedding Photography coverage – including pre-ceremony (if location close-by), ceremony, formal photos, and 2 hour portrait session in an unforgettable location of your choice. Online gallery + digital delivery of 250+ web resolution/edited photographs. USB of full resolution Photographs for printing. #2. INVITING YOUR FRIENDS? NEED HAIR & MAKEUP? Up to 4 hrs Elopement Photography coverage – including pre-ceremony (if location close-by), ceremony, formal photos, and 2 hour portrait session in an unforgettable location of your choice. Online gallery + digital delivery of 250+ web-resolution/colour corrected images. Council permit (if required) for up to six guests. PLUS - KEEPSAKE WOODEN BOX WITH PERSONALISED USB AND 25 GIFT PRINTS! #3. RUN AWAY AND GET HITCHED AND ENJOY YOUR OWN MINI-KOMBIMOON! Professional Celebrant Services - All Legal Paperwork & a Bespoke, heartfelt wedding ceremony (plus up to six guests in attendance). USB of full-resolution photographs for printing. PLUS : Three night hire of an authentic restored VW Campervan to truly run away and get hitched in style! Choose from a fleet of 5 gorgeous Kombis, all self-contained with kitchen, double bed, storage and more. Exchange vows and then drive off into the sunset on the open road - the ultimate boho elopement experience. *Conditions apply. #4. hitched! 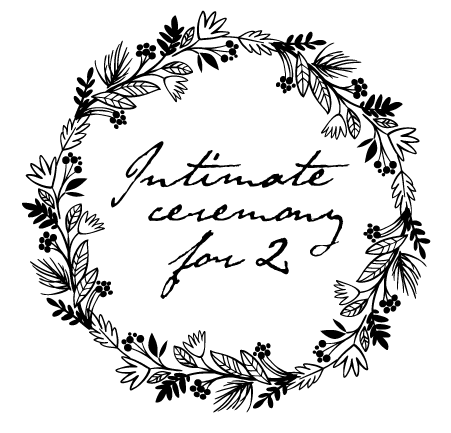 Intimate ceremony for you and up to six guests, HAIR & MAKEUP, WEDDING CAKE, CHAMPAGNE & CONFETTI . Please note that USB/Keepsake box is not included with Package #1 "Just the two of us" - but may be purchased as an extra. A la carte options (henna tattoos, albums, prints, wedding videography, additional flowers or photography time) available on request. We are happy to tailor a photography package if you would like to book our photography services for your wedding, please enquire, up to 4 hours of photography for $1275. We can also organise (non-legal) commitment ceremonies and vow renewals at a reduced rate. Please enquire for a tailored package. Ceremony permits for Package #1 are to be purchased by the couple if a popular area (i.e beach, park or lookout) is requested. Drop us a line - we'll be happy to enquire. We offer all Wildhearted elopement ceremony packages on Wednesdays, Saturdays & Sundays. All Wildhearted Package prices include our travel within South East Queensland/Northern NSW areas. *Terms & Conditions apply. *Additional travel fees may apply for a la carte pricing. Enquiry? Questions? Need More information?